1	To poach the figs, measure 1/4 cup water and the sugar into a small heavy-bottomed saucepan. Stir the mixture together with a wooden spoon, incorporating the sugar without splashing it up the sides. If crystals do get on the sides of the pot, use a clean pastry brush dipped in water to wipe them off. (The goal is to prevent the syrup from crystallizing.) Add the cloves and star anise. 2	Bring the mixture to a boil over a medium flame and cook for 7 to 10 minutes, until the syrup is amber-colored. For even coloring, the flame should not come up around the outside of the pot. 3	Add the red wine, port, figs, and cinnamon, standing back a bit, as the syrup is hot. Don't panic when the syrup hardens; this is the normal reaction when liquids are added to hot sugar. Continue cooking the mixture over a medium flame for 2 minutes, until the sugar and wine blend. 4	Reduce the flame to low and simmer for 30 minutes, stirring occasionally. The figs will murmur quietly as they are jostled together by the flame; they are ready when the wine has reduced by half. Remove the pan from the stove and cool to room temperature. 5	Fish out the star anise and cloves. Pour the cooled figs, with their liquid, into a food processor and purée until smooth, about 1 minute. Add the softened butter to the fig paste and process until smooth. 6	The fig butter can be spread right onto the buckwheat scone dough or stored in the refrigerator for up to 1 month. If it is refrigerated, bring it to room temperature before using. 1	Sift dry ingredients into a large bowl. 2	Add the butter to the dry mixture. Rub the butter between your fingers, breaking it into small pieces. Continue rubbing until the butter is coarsely ground and feels like grains of rice. 3	Add the cream and gently mix it into the flour with a spatula until the dough is just combined. 4	Use a spatula to transfer the dough onto a well-floured surface. Flatten dough with a rolling pin into an 8-inch wide by 16-inch long rectangle. 5	Spread the fig butter over the dough. Roll the long edge of the dough up, patting the dough as you roll so that it forms a neat log 16 inches long. Roll the finished log so that the seam is on the bottom and the weight of the roll seals the edge. 7	While the dough is chilling, preheat the oven to 350°F. Line two baking sheets with parchment paper. 8	After 30 minutes, take both logs out of the refrigerator and cut each half into 6 equal pieces about 11/4 inches wide. Place each scone flat, with the spiral of the fig butter facing up, on a baking sheet, 6 to a sheet. 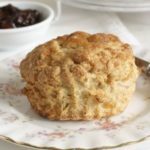 Give the scones a squeeze to shape them into rounds. 9	Bake for 38 to 42 minutes, rotating the sheets halfway through. The scones are done when they are golden brown. 10	Enjoy promptly for best taste.